located by the rural fringe of london. 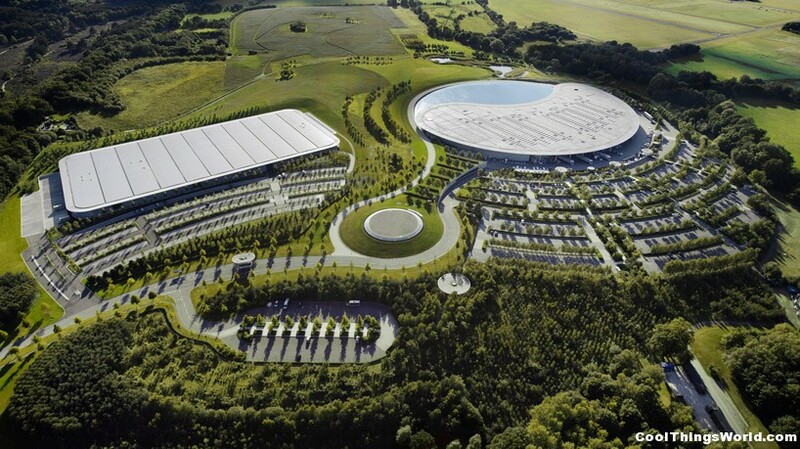 the 34,5000 square meter facility will contain all future mclaren road vehicles. the assembly plant is a state-of-the-art production space which is connected to the existing technology center via an underground walkway which exhibits interactive installations. mimicked beneath the overhang of the roof canopy. road carving itself into the landscape. the roof collects rainwater and has the ability to have photovoltaic panels integrated in the future. the space is flexible in comparison to other modern manufacturing facilities with a wide span between columns and ceramic flooring. of the plant and the system of networks where the components are delivered, assembled, painted, tested and finally detailed.